Modern Art. An interesting concept. Art can be anything, depending upon the perspective of the person and his or her point of view. Modern Art is this week’s challenge for Ed’s Sunday Stills. Here is my entry. This was taken at Thanksgiving time in Hood River, Oregon, on the Columbia River Gorge. This area is the windsurfing capital of Oregon during the summer months. 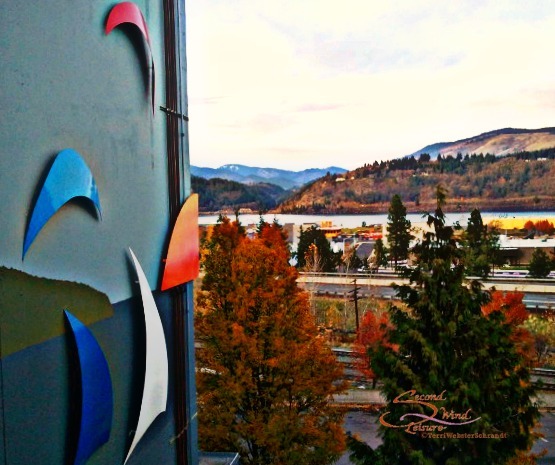 This artwork depicting sails and kites can be seen on the east side of the building of the Full Sail Brewery overlooking the Columbia River. We stopped there to get some goodies to bring back for Christmas presents that year. I am the first to admit I don’t understand modern art. I will go to a museum and look at it though. Even if I don’t like it, I will try to figure out what the artists was doing or is trying to say. It’s like a puzzle for me. Very nice picture, Terri. I love the colors of nature. Fall is my favorite season. And we both are into street art this week!! Beautiful! Creativity without a doubt. You had me at “Brewery” Lol! Great art and glad you posted this. Love the juxtaposition of the modern art, with nature. Have a great start to your day and thank you for sharing this pretty pic with us! Thank you, LIa! I don’t have many photos of modern art as the challenge asks. Glad you liked it. It was really beautiful there and COLD!